Apache Pressure Products | Swing Check Valves - Chase Controls, Inc.
Chase Controls is a stocking distributor for Apache Pressure Products. Apache manufactures ball valves, needle valves, and check valves. Apache offers four different series of swing check valves in various pressure ranges. 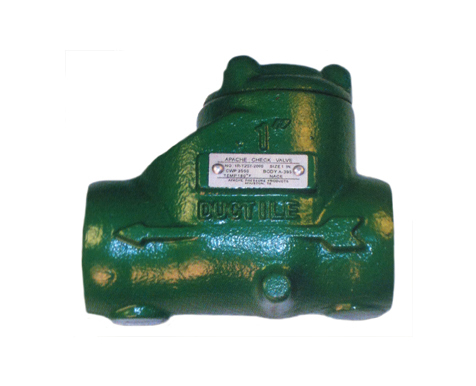 The ductile iron and WCB body valves are offered in 1”- 4” NPT. Forged swing and piston checks are offered in ½”- 2” NPT and brass cast body valves are offered in ¼” – 4” NPT. The forged steel check valves are designed as a bolted type and ductile iron and brass body valves are a threaded design.